Stockholm / San Francisco, 3 September 2018: Today, Swedish beauty tech brand, FOREO, unveiled the world’s smartest and smallest beauty coach in the form of the AI enabled smart facial cleansing device - the LUNA fofo. An addition to the popular celebrity and media favourite LUNA family, the LUNA fofo ushers in the era of personalized skincare accessible at the touch of a button. As its name and design suggests, the LUNA fofo is like having a personal beauty coach to cater to your every skin need, every day. Ever since its Beta version launched in July in the US, where FOREO shipped 900,000 LUNA fofos to US beauty fans in partnership with the FabFitFun Beauty Subscription site, LUNA fofo’s skincare algorithm has been getting smarter by the day - clocking up an impressive 700 years worth of intelligence in the last two months alone and almost 1 million skincare consultations under its cute little belt. FOREO Founder and CEO Filip Sedic, who created the award-winning LUNA with his wife in 2012, says this is a bold new frontier for the Swedish beauty-tech brand, “This FOREO device is capable of self-learning and is differentiated from other skincare products by its ability to advance day after day.” Currently LUNA fofo’s skincare treatment balances moisture levels with information from a skincare quiz on the FOREO For You app to customize the frequency, power and duration of T-Sonic pulsations on the skin. This ensures an optimized treatment for each individual that will update according to your skin’s condition. LUNA fofo is the latest beauty gadget from FOREO disrupting the industry incorporating machine learning and personalisation features. LUNA fofo is enabled to give users their skin age, rate their skin out of 100, report on hydration percentages and then with this personal data, it will fully customize the cleansing routine to improve results. Owners are advised to use the analysis sensors once every two weeks to check the progress, but once the routine is saved they simply turn on LUNA fofo and let it get to work. The end goal is to see their skin over time and reach that coveted score of 100 / 100. 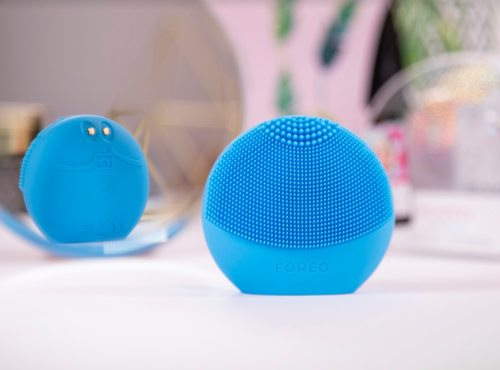 FOREO’s LUNA devices currently sell one every 3 seconds around the world and if LUNA fofo is to head the same way - this little beauty gadget will clock up more than 1000 years of intelligence in less than a month. LUNA fofo is available in a range of seven colors: Pearl Pink, Aquamarine, Fuchsia, Midnight, Mint, Purple, and Sunflower Yellow. LUNA fofo is available now on foreo.com/luna-fofo and at selected retailers across the globe, retailing at 89 USD / 89 EUR / 79 GBP. Find out more at foreo.com/luna-fofo. Connect, follow and chat with us on social media via Instagram’s @foreo and see what influencers worldwide are shouting about under #FOREO #LUNAFOFO. For media interviews or further commentary from FOREO CEO Filip Sedic, please contact dawn.watt@foreo.com or call +385 99 4902 870. LUNA fofo is an ultra-hygienic facial brush fitted with advanced skin sensors that analyze your skin and prepare a personalized routine that is unique to you. Connected via Bluetooth, it saves all results on the app. The algorithm is continually updated via artificial intelligence and machine learning to optimize its routine, and create customized facial cleansing for individual users. Aside from its unique algorithm, LUNA fofo boasts many of the signature features that have FOREO’s facial cleansing devices the number one in their category. Like many Swedish companies before it, FOREO yet again is leading the way for innovation to shake up the beauty industry once more. LUNA fofo samples can be requested from dawn.watt@foreo.com for review purposes. 1. Download the new and updated FOREO For You app here via Android or Apple. 2. Create your account and answer a series of questions about your skin, before conducting your skin analysis. Make sure to remove all make-up for accurate readings. 3. Once complete, you can review your skin profile, and you personalized routine will be saved to LUNA fofo. 4. Lightly dampen your face and apply cleanser to the skin or directly to LUNA fofo. Use it in circular motions and a pulsation will prompt you to move to the next section of your face, in the same sequence as your skin analysis. 5. FOREO recommends you analyze your skin once every two weeks to check on skin progress and update your cleansing routine. Note: Every time you turn on LUNA fofo (even without the app) it will remember your last personalized routine. Repeated analysis once every two weeks, or when your skin is exposed to a change in climate, is recommended. This press release was distributed by ResponseSource Press Release Wire on behalf of FOREO EUROPE in the following categories: Men's Interest, Health, Home & Garden, Women's Interest & Beauty, Consumer Technology, Business & Finance, Retail & Fashion, Manufacturing, Engineering & Energy, for more information visit https://pressreleasewire.responsesource.com/about.